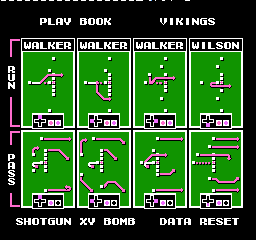 My friends and i were talking about what would be the best playbook you could put together in tecmo super bowl. What plays would you add?? would you have all your plays go together ( same formation ect...). I thought i would see what you guys think. Post a screen shot of your playbook if you want to let everyone see. I will try to do the same when i get home from work. Just a thought. Love the sight. This has been discussed a number of times before. You might want to use the search tool to see previous answers. In online play there is very little variation in what plays people select. I usually switch it, but always use the following 2 plays. Sorry i tried to the search, but must of gave up to soon. 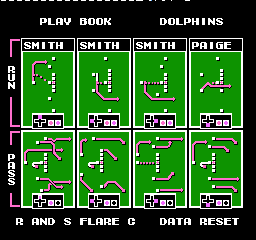 Anyways here are two edited playbooks i like. here's my issue with the top one, there is no similar run to a-up. all you have to do is call b-left every time and both of those plays are blown up before you start effectively eliminating 1/4 of your possible plays.. This first one is the one I used as a beginner, but I now evolved it to the one below. The bottom playbook is worse than the top one and both of them have problems. The only play I see on here that I actually use is Pro T Flare D.
Those are my faves, but I like to mix them up a lot to be honest. I know some hate the Sweeps and believe running between the tackles is the way to go, but I still think using both Sweeps gives you better playcalling options. 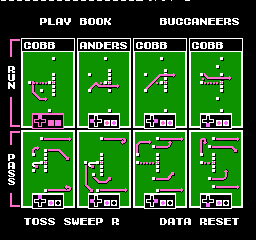 Screw the formations for the pass plays -- these are 4 best pass plays I've found in playing. R&S 3-Wing is highly underrated and more than just a deep JJ play. R&S Flare C is a solid pass play with good options deep and a dump pass to the HB (that takes some timing to get used to) that oftentimes causes opponents a lot of problems. And Pro T Flare D is a play that should probably be banned from the game altogether because it's basically unstoppable even with a mediocre TE. Slot L Z Drive has a man-in-motion that is a dead giveaway to the defense. However the routes and the movement of the play can make it hard to cover even if you know it's coming. I'll be honest, I don't use the play a lot usually, I mainly stick to the other 3 passes and pull it out to really throw in a monkeywrench. But I like the placement of recievers, and honestly it's not a bad play to scramble the QB out of even if need be. 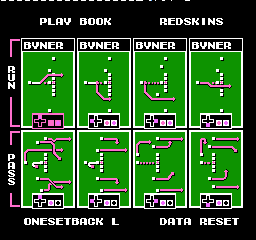 This is my typical playbook. I'm a heavy passer. If you just gave me the first three pass plays, I would be happy. 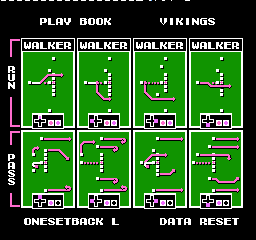 Slot 1: "R&S Sweep L"
Slot 2: "T Sweep Strong"
Slot 3: "R&S Sweep R" This is what I call the "Bo Jackson" play. Slot 1: "R&S Flare C" (always) - one of the best passing plays, can make completions to RB2 or RB1 if there is a blitz. Slot 2: "Pro T Flare D" (always) - also one of the best plays. RB1, most of the time will run in the flat and you can complete a pass when everyone is covered. Slot 3: "Shotgun X Drive" (always) - great play, also, on a blitz, you can make a completion 90% of the time vs COM. 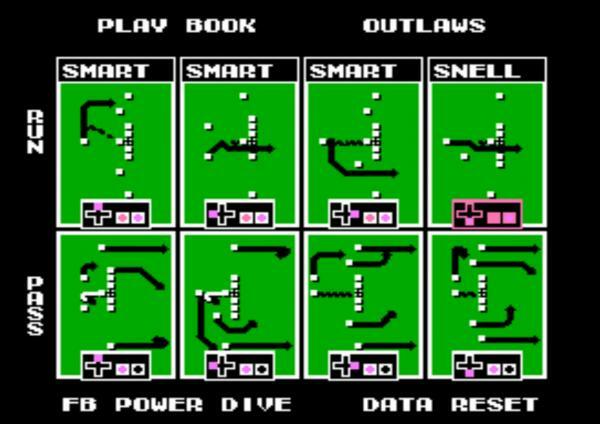 Slot 4: "R&S Y Up" or "Redgun Z Slant"
The fact that I only use 2 formations and one shotgun do make is somewhat difficult to figure out which play was picked. There isn't a lot of razzle dazzle, but chances are I have enough WRs to get someone open or have on option somewhere, Even during blitzes. Pro T Fake Sweep Right, Pro T Dive, and Pro T Play Action D all tie into one another. Most people prefer the screen for their first pass play, but Play Action D works better for practical purposes. If you can establish the dive, you can tear off big chunks of yardage with the sweep or sling the ball down the field with the play action. Pro T Offtackle Right and Pro T Flare D are both virtually unstoppable. Pro T Flea Flicker is a bit of trickery that doesn't look to dissimilar from any of the right-side runs. The Cross Run Left provides the speedy McNeil a chance to get a first down every time. As you can tell, it's an all Pro T offense except for the Shotgun Z S-In. It will eventually become obvious to the defense when you run the last one, but it's still pretty hard to defend even if you know what's coming. On blitzes, the dump to the running back usually guarantees at least couple of yards. Is it legal, in tournaments, to run T-form plays with singleback teams so that WR1 is in the backfield? Been trying it with the Cards in Season mode to decent effect and I'm sure teams like Atlanta, Houston, Washington etc. could pull it off too. yes, as long as the WR does not have any "running" plays. I'm sure this isn't the most effective, or sneaky, or smartest playbook choice for a tourney or anything. But I play against the CPU a lot these days and have fun with this one...cheers!